18-Loch Golf Course Pebble Rock Golf Club GOLF BOOKINGS & INFO MEMBERSHIP & FEES BUSINESS LEAGUE 2016 CONTACT US GOLF COURSE CLUBHOUSE CATERING & EVENTS THE DEVELOPMENT OVERVIEW The well known Pebble Rock Golf Course is a mere 25 kilometres outside the CBD of Pretoria. 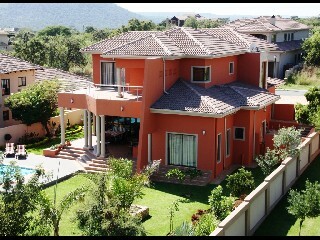 It is close to the Roodeplaat Dam and next to the Sable Hills Waterfront Estate. Golfers enjoy the Pebble Rock Golf Course because of the challenging greens. The course have water obstacles at 11 of the 18 holes during the rainy season which will test the best players' skills. Designed for the golfer who enjoys a good golf links challenge combined with water obsticals and a lovely bushveld feel. The clubhouse forms the focal point of the Pebble Rock Golf Village. Aesthetically designed by Bild Argitects, the clubhouse offers residents, club members and visitors a relaxing environment in which to socialise, unwind and enjoy the bushveld atmosphere. We have the required facilities for any function or event. Many well known companies have held very successful events at our clubhouse and bookings for weddings, golfdays, birthdays and any big or small corporate functions can be done with us. Objekte am Golfplatz Pebble Rock Golf bzw. in der näheren Umgebung.